M-Tech Laptops knows better than anyone else how to custom build a high-end performance laptop that will exceed your needs. 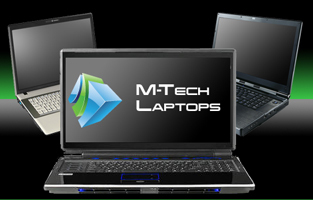 M-Tech offers a complete line of laptops to meet your performance, portability, and ruggedized requirements. Sure, you can buy a name brand laptop anywhere, sometimes for just a couple of hundred dollars, but what are you getting? The bulk laptops from HP, Dell, Sony, etc., include mass-produced, dated technology loaded with tons of junk software you don't need or want. Between the old technology, poor construction, and junk software, these machines will consistently fail to do the tasks that you need them to do. Check out our truly custom laptops with the latest technology that's available nowhere else, unsurpassed build quality, and just the software you need. Click on a laptop category below to start your shopping: Should you have more than one category you need a laptop for, choose one that appears in all relevant categories. Click here to view, configure and order your custom M-Tech laptop. M-Tech is more than just the world's fastest laptop manufacturer; M-Tech provides a wide array of powerful custom desktop PCs that include business desktop PCs, CAD desktop PCs, graphics workstation desktop PCs, and the best gaming machines available anywhere. M-Tech carefully chooses each component model and part number that goes into our Desktop or Workstation configurators, so when you customize the hard drive, memory, graphics cards, etc., you are choosing from the best components available. Business professionals who place a high demand on performance and ongoing uptime often prefer custom systems constructed with high quality components. Quality takes precedence over searching for the lowest cost through the use of cheap components. Our systems are built with the best brand-name components and have undergone extensive performance testing, resulting in the best long-term value and reliability. Thousands of customers agree. Off-the-shelf systems from other brands can force buyers into accepting (and paying for) components they may not need, while potentially excluding components that could provide better functionality for their unique application. Those off-the-shelf systems are typically not built or supported in the USA; all M-Tech systems are 100% USA Assembly and 100% USA Support! The M-Tech 5038A-i Workstation is a High-Performance system featuring server-grade memory, networking, and Xeon CPU, designed for CAD, data analysis, video editing, and animations. It will perform tasks faster than a Desktop PC and is designed to run workloads 24x7. The cooling system in the case is designed for up to 4 hard drives and multiple professional graphics cards. The M-Tech DQ1500Q Desktop PC will be enjoyed by Enthusiasts, Home power users, Gamers, and Professional content creators, performing tasks that are impossible on a low-end off-the-shelf PC. Featuring an Award-winning motherboard, Liquid Cooling, multiple M.2 NVMe drives, powerful audio, and Intel Core X-Series i9 CPU choices, along with slots for 3x Graphics Cards, the D1500Q is the fastest desktop ever available from M-Tech. Look no further than the M-Tech Mini PC for intense gaming, movies & music, content creation, and heavy workloads when space is at a premium. With a case just 8.3" long, 4.6" wide, and 1.1" thick, the M-Tech Mini PC can fit behind a monitor, on the wall, or just be tucked out of the way. With a 6th-Generation Intel Core i7, 4K video, two M.2 NVMe drives, built-in Card Reader, Wi-Fi/Bluetooth, and four super high-speed USB 3.0 ports, you will be amazed at what such a tiny computer can do! 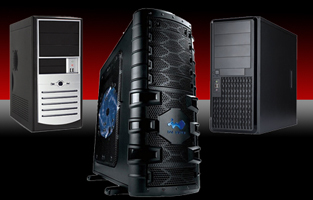 Click here to view, configure, and order our available desktop PCs.